It would be useful if this Bulletin were able to offer every six months an integrated summary of the current situation in Tanzania. This issue certainly does not aspire to do so. It consists of five segments. It begins with Tanzanian statements on the Rhodesian issue. It continues with an article about the need for new techniques of building houses in Tanzania’s villages. The contrast is deliberate. Tanzania operates with effect on the scale of world affairs but much of the crucial change and planning for change happens at the very local level and in regard to the fundamentals of village life. The third section is a digest of Tanzanian news, which moves in the same way from the overall economic position of Tanzania and its foreign policy to planned change at the village level. Then comes a fourth section reporting on life in the rural areas from the perspective of an Anglican missionary – a report particularly appropriate in the centenary year of the UMCA in Tanzania. Finally there is a review article on three recent books on Tanzania, each of which does attempt to interpret the totality of the Tanzanian situation and each of which tests its interpretation through its own estimate of what is happening locally. In the six months since our last Bulletin Tanzania has continued to work closely with Zambia and Mozambique in a combined strategy for the liberation of Zimbabwe. This strategy consists of the following elements: the restructuring of the guerillas and their ‘political education’; the recognition of the guerillas as a ‘third force’, distinct from the African political leaders as well as from the Rhodesian regime; insistence upon the right of the guerilla ‘third force’ to be represented in negotiations to bring the war to an end. It also consists of an appeal to Britain, America and the Commonwealth. At the end of March the Tanzanian Government submitted the following memorandum to the Secretary General of the Commonwealth, who circulated it to the Sanctions Committee. The talks between Smith and Nkmo have ended. Two things are now beyond all reasonable doubt; first, that no responsible African Rhodesian leader will accept anything short of majority rule in Rhodesia; and second that Smith is still opposed to majority rule on principle and for all time … Two things should therefore now be clear to everybody. Armed struggle is the only way in which majority rule can be achieved in Zimbabwe; and there will be an armed struggle to achieve majority rule. The necessity of war is regrettable. But it is a fact. The choice of armed rather than peaceful struggle has been made by Smith… All Smith’s thinking, his statements and his actions will be designed to secure company in this political suicide. The two most open methods used to attract support will continue to be allegations that the Nationalists are communists, or black racialists – or a combination of the two. But whatever Smith’s rationalisations, his continued purpose will be to get support for the maintenance of minority rule. When the pressure on the Minority Regime gets very great, Smith may even renounce U.D.I., and call upon Britain to resume responsibility for the protection of her colony … A renunciation of U.D.I. would not settle anything. The minority rebellion took place because of a problem. That problem was the minority resistance to the principle of majority rule. Whether the Rhodesian White minority now resists majority rule as a so-called independent government, or again as a government of a self-governing colony, or as a political and economic group in a colony directly ruled by British administrators and British troops, it clearly intends to go on resisting majority rule. And ending of the rebellion by Smith’s renunciation of U.D.I. would therefore still leave the problem of majority rule to be solved. U.D.I. is relevant to the issue only in legal terms and the opportunities they create. No one can like the prospect of an intensified armed struggle in Rhodesia. The friends of Africa, and friends of those White people who are willing to live and work as loyal citizens of a Zimbabwe ruled by the majority, will be wishing to do three things. First, to reduce the period and the bitterness of the fighting, and therefore of the suffering of both black and white; second, to avoid the conflict taking the form of a generalized race war; and third, to avoid the identification of minority rule with the Western block and of majority rule with the Eastern block. It is still possible for the world, and especially the Commonwealth, to make some contribution to these desirable ends. The unfortunate truth is that bloodshed in Rhodesia is basically being caused by people who claim that Rhodesia is their country but whose loyalty is really to their own privilege … The whole of Africa, and the world, will benefit if those who will leave Rhodesia anyway are persuaded to leave without plunging the country into the misery of a protracted liberation war. And the alternative to fighting which is most likely to have this effect is the offer of a welcome and a home in other countries. This would involve some kind of assurance of the means of a reasonable livelihood if they were young enough to work, or a means of living in reasonable comfort if they were older. There are two things required. The first is a willingness to receive the emigrating Rhodesians, and to waive the more restrictive health, skill and age qualifications for the purpose. The number and type of countries to which the emigrants would be interested in going is limited. They include Britain, the USA, Canada, Australia and New Zealand, and some mainland European countries. If all such countries would publicly state their willingness to accept Rhodesians who come within a certain period, I believe that they would be making a contribution to the growth of peace and justice in Southern Africa. The second thing necessary for such a purpose is a Commonwealth fund to finance the movement and resettlement of those would-be emigrants who have no external resources … Technical difficulties exist in any proposals. And whatever scheme is worked out there will be anomalies and injustices remaining. But the Rhodesian problem is urgent and internationally dangerous. We cannot wait while we search indefinitely for perfect justice. Events are moving very fast now; the armed struggle has begun and people are dying. If we are to reduce the conflict and its dangers we have to act quickly. The objective of building research in any country in the world is to facilitate the development of a ‘Building Industry’, in the broadest sense of the word. This includes the production of building materials and components, research into methods of work, tools and equipment, structures and techniques, as well as the erection of finished buildings. In this respect, there is no difference between industrialised and developing countries. The major difference lies, not in the aims and purposes of building research, but in the economic circumstances and political framework within which such research must take place. In the fifty or so poorest countries in the world, a total of more than 2,000 million people enjoy a Gross National Product of less than 300 dollars per head. By comparison, Norway has a GNP of 3,130 dollars, and the USA of 5,160 dollars per head. In Tanzania, the average GNP per inhabitant is only 100 dollars, or 1/30 of that of Norway. In an attempt to raise the living standards of the majority of the population, priority is being given to the development of agriculture, education and public health and there is a conscious effort to decentralise and build-up the economy of the rural areas. All this requires improved communications, the building of schools, health centres and administrative premises, the provision of storage facilities for agricultural products and – last but not least – the provision of good houses that can be seen to be a substantial improvement on present living conditions. Given the low level of income, such a programme clearly cannot be realised on the technological standards of the industrialised countries. At present, some 10,000 houses a year are built by paid labour, while about 600,000 are constructed by communities working on a self-help basis. The 10,000 houses are to the 1950 standard of the Norwegian Housing Bank. The 600,000 have an average life of only 6 years, being built of organic materials timber, palm leaves, grass – which rapidly succumb to decay and the depredations of termites in the hot, humid climate. The main focus of building research in Tanzania must therefore be to contribute to the creation of houses and other buildings which are more durable and conform to better standards of health; and this can only be achieved by the development of a technology based on local materials and an extension of traditional skills. Unfortunately, foreign ‘aid’ often has, in this respect, a negative effect. Many donors insist, on prestige grounds, that the building content of aid programmes reflects the technological level of the donor country. European architects and engineers do the planning. They follow instructions, standards, norms and styles coming, for example, from Germany, Britain or the USA, which in turn leads to the importation of practically all building components. The consequent multiplicity makes it impossible to hold the necessary spares and the repair and maintenance, both of machines and buildings, is a constant headache. Such external aid has, on the other hand, few positive repercussions. This building, or that technology, cannot be copied and exerts no influence on traditional building activities. : The gap between them is too great. These reflections may seem obvious, but they hardly begin to be considered by many European architects who do their design work, either sitting at home, or in the branch offices of their firms in developing countries. Their activities are purely of a business character and result in no diffusion of technology, their architectural style being, in any case, alien to the context in which the buildings are to be erected. The use of locally available raw materials for building can lead to significant savings in both money and, even more important, foreign exchange. For example, a bag of cement which at the factory in Dar-es-Salaam costs 16/- may, in the remoter parts of Tanzania, cost 35/- or even more. The greater part of the cost (oil for cement production; lorries and fuel for transport) is in foreign exchange. The substitution for cement of chalk found locally would have obvious advantages. This requires, not only a thorough knowledge of the raw materials locally available for building purposes, but also careful consideration of their use in conjunction with the traditions and manual skills available in the areas in which they are found. Most raw materials cannot be used directly in building but require processing and/or manufacture into various components such as bricks, tiles, boards or windows. Although most such components can be produced with relatively small capital investment, considerable organisation is required, and a number of obstacles have to be overcome, before a National Plan for the development of the building materials industry can be evolved. As the level of activity in the building industry tends to fluctuate widely from year to year, it is important to establish national annual and five-yearly building programmes to ensure among other things, a more stable demand for building products. There has also to be a wholesale distribution system with buffer stocks to facilitate the planning of small or large deliveries of materials and guarantee a stable demand from producers. Finally, as the building industry is accustomed to using imported materials and components, a case may be made for deliberate restriction of imports in order to stimulate the demand for local products. Perhaps in this context the best kind of ‘aid’ is that which, in place of strings to an external market, stipulates that all building materials used in a project must be produced locally and which, where necessary, assists in the establishment of their local production. Building activity resembles a chain. In addition to the local production of materials and components, it is also necessary to develop structures, techniques of construction, and methods of work which make good use of the materials available and are best suited to the prevailing conditions and skills. This demands not only research into foundations, floors, roof construction etc., but also the dissemination of information and the training of local craftsmen, architects and engineers. Written information in the form of ‘handouts’, although important in the longer term as a compendium of technology, is of only limited value in developing countries such as Tanzania, where the majority of ‘self-help’ builders are illiterate. Much greater use can be made of the radio. But perhaps a network of local instructors/ demonstrators is the most effective means of disseminating the message of building research. An organisation along these lines is currently being built up in Tanzania. Before new techniques can be widely accepted, it is also necessary in many developing countries to amend or replace the existing building regulations, which are often an exact copy of those of the Colonial power. The problem is to produce guidelines that deal with the most elementary questions, such as the building of foundations, sewage disposal etc., while at the same time including the regulations necessary for larger buildings. In Tanzania, regulations are now being drafted along these lines, at three levels – the single, one-storeyed house, the two-storeyed house with more emphasis on load-bearing walls etc., and the multi-storeyed building, involving a whole series of regulations affecting hygiene, safety, security against fire risks, etc. Many European contractors have now ceased to operate in Tanzania, as they no longer enjoy the privileged position of Colonial times. The role of the contracting industry has, in any case, altered with the Government’s policy of decentralisation. Many small administrative, health and educational buildings spread over the whole country call for a decentralised industry which, at present, simply does not exist. There is a severe shortage, not so much of craftsmen, but of managers and supervisors capable of organising and administering small businesses. In addition, building work is casual and spasmodic; safety precautions on building sites are minimal; accidents are numerous; and there is generally no sanitation. There is clearly a need for a concerted effort to raise the status of workers in the building industry, and to organise work on a continuous and more stable basis. This can only happen within the framework of national programmes for construction. Such programmes will facilitate the analysis of the distribution, use and build-up of manpower resources and materials production within each District. They will also illuminate the need for local technology and show how, and at what cost, one can afford to build. It is only with sound economic planning that the foundation may be laid for a reduction in imports, the development of a realistic building economy and the establishment of a building industry that is locally based. Good physical planning requires architects, engineers and planners, all of whom must be in tune with local policies, values, norms, resources, social and cultural organisation and conditions. In Tanzania, those responsible for planning have, in whole or in part, a European background and/or training. A Tanzanian student trained in an industrial country will gain unusable knowledge in many areas. To expect him to undertake parallel studies leading to an understanding of values and norms more relevant to his own needs, to adapt his knowledge to use in quite different circumstances, is to make enormous demands on him. Therefore it is important for developing countries to establish their own training on a local basis as quickly as possible. Also, the planning process itself, which is at present bound up with a system of training, professional agreements, methods of tendering and public regulations developed in a totally different context, must be adapted and improved. This article has dealt briefly with a number of problems facing Tanzania in relation to the building industry and physical planning. If one poses the question of the need for research, it transpires that there is a long and varied list of questions to be looked into, such as the exploitation of local raw materials; the production of building components; the documentation of existing technology, and the evolution of a new technology based on local conditions; the development of a local contracting industry; documentation and development of the basis of planning; and, finally, the development of an apparatus for planning which is based on local policies, resources, technology and culture. A Bank of Tanzania bulletin earlier this year gave details of recent economic performance. In the season 1974/5 coffee output was down by 7%; cashewnut production down by 20%; sisal production for the first nine months of 1975 was down by 18%; the 1975 cotton harvest was the lowest for years. The export of industrial goods fell by 50% in the first nine months of 1975. The total export earnings were down 10% from the same period in 1974 and Tanzania’s trade deficit had significantly increased. The civil service in Tanzania has grown rapidly. Early this year there were an estimated 140,000 civil servants – 70% more than the official figure for early 1975. However in July 1975 President Nyerere announced plans to reduce the civil service by 20% by means of early retirements, cutting of over-manning, etc. In March 1976 the Ministry of Manpower Development confirmed that 9,496 civil servants had been declared redundant effective from February 29th. In statements this month the Tanzanian Government has condemned the Israeli raid on Entebbe and has announced the withdrawal of Tanzanian athletes from the Olympic Games. Both statements amount to more than routine reactions. Tanzania has in the past strongly condemned the regime of General Amin but makes the distinction between the right of Ugandans to resist a regime which has oppressed them and the lack of legitimacy of the Israeli action. In Bayi the Tanzanians possess one of the leading athletes of the world; withdrawal from the Games has deprived the nation of an ‘almost certain medal. e) The magazine Africa in its July issue carries a 30 page Saba Saba supplement in which there are features on the implementation of ujamaa, the movement of the capital to Dodoma, mining, communications, etc., and a general survey of political, economic and social developments. The church in Tanzania has long ceased to be dominated by expatriate clergy. And yet, as Canon Lamburn writes, there is still need of volunteers who are prepared to accept the direction of the Tanzanian leaders of the church and who are equipped to help with the kind of service which at the moment is its task. I should add that it was suggested to me that this Bulletin would be a good place in which to record the centenary and it seemed to me that this record of the work at Kindwitwi would stand here more appropriately than more formal notice of history and its celebration. John Hatch, Two African 5tatesmen – Kaunda of Zambia and Nyerere of Tanzania, Secker and Warburg, London, 1976, 6 pounds. Cranford Pratt, The critical phase in Tanzania. 1945 – 1968. Nyerere and the emergence of a socialist strategy, Cambridge, 1976, 7 pounds 50. Issa G Shivji, Class Struggles in Tanzania, Heinemann, London, 1976, 4 pounds 50. These three books, published within months of each other, provide three strikingly different ways of looking at the socialism of contemporary Tanzania. John Hatch approaches Tanzanian socialism by means of biography. In his view the socialist ideology in Tanzania is the product of Julius Nyerere’s role as ‘philosopher king’, and in order to understand the ideology one has to understand Nyerere’s origins, education and experience and the character which they have shaped. 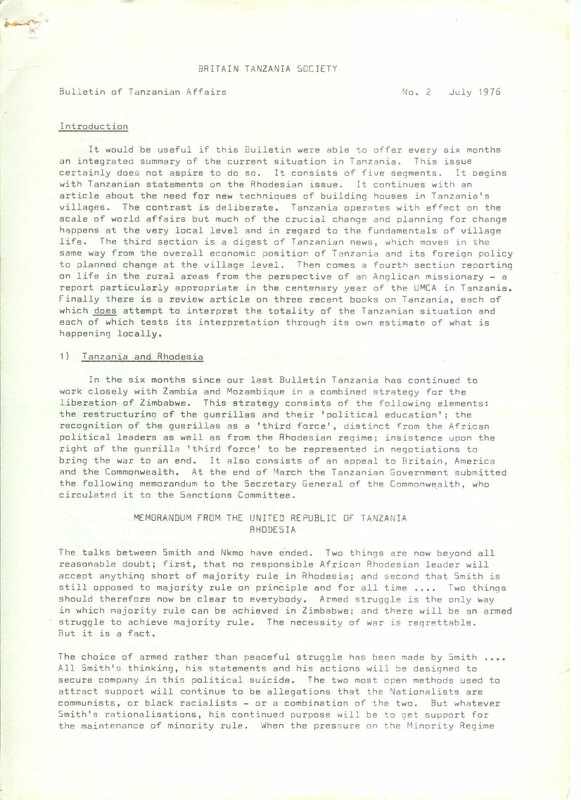 Cranford Pratt, by contrast, approaches Tanzanian socialism by means of political history. He sees developments of thought in Tanzania as ‘to a remarkable extent the work of one man’. But he sees as the crucial determinant of Nyerere’s own responses the particulars of post-independence politics. In Pratt’s eyes it is a matter of the choice between ‘political strategies’ and he traces the development of a socialist programme by means of a detailed narrative account of political events. Issa Shivji, finally, approaches Tanzanian socialism by means of class analysis and the theory of class war. He cites with approval Carr’s belief that ‘the facts of history are indeed facts about individuals, but not about the actions of individuals performed in isolation, and not about the motives, real or imaginary, from which individuals suppose themselves to have acted. They are facts about the relations of individuals to one another in society and about the social forces which produce from the actions of individuals results often at variance with and sometimes opposite to the results which they themselves intended(1). His book is intended to constitute ‘a fundamental break’ with the emphasis on ‘the committment of individuals’. Accordingly Nyerere is hardly discussed; no biographical data is given: he is cited occasionally merely as representative of the regime and of his ‘class’. Nor is a detailed political narrative given. The policies pursued by Nyerere’s government are seen as resulting from its perception of its class interest. These three contrasting approaches result in, or perhaps imply from the beginning, three equally contrasting judgements of the reality and success of Tanzanian socialism. Hatch’s book is written in almost hagiographic style, seeking to present a new and saving doctrine to a vexed world. For him the personal achievements of Nyerere’s life are inseperable from the achievements of Tanzanian socialism. Nyerere is ‘the most radical socialist leader in the world’, and his ideas will ‘profoundly influence the development of society in Africa, ideas in the third world and perhaps the future of human society’. Cranford Pratt is more cautious. If Hatch echoes the high aspirations and hopes of the immediate independence period, Pratt echoes the more sombre realisation of the continuing poverty of Tanzania and of the ambiguities within its ruling party. For him Tanzanian socialism is a ‘political strategy’ in the process of working itself out: faced with great and continuing difficulties; making many mistakes: but nevertheless a genuine and valid option, striking more or less the right balance between the thrust to equality, the need for efficiency and the desire for participation. Issa Shivji sees current Tanzanian socialism as an ideological cover for the interests of the ruling class, the ‘bureaucratic bourgeoisie’. They have used its slogans to validate their dominance of economic resources through nationalisation; their destruction of the rival commercial bourgeoisie; and their undermining of the kulak class in the countryside. In this clearing of the board they have served a progressive function, and their use of the slogans of socialism has allowed a more radical debate to begin. But Shivji believes that the progressive function of current Tanzanian socialism has ended. Today the conflict of interests between the bureaucratic elite on the one hand and the workers and peasants on the other has become obvious: class war between them will result in a genuine socialism. The three books abound in explicit and implicit condemnation and contradiction of each other. Shivji attacks the ‘liberal academics who would only want to see celebration of the so-called Tanzanian experiment’. He writes of ‘an intellectual climate where celebration and occasional criticism, rather than consistent explanation,• are the order of the day’. There is little doubt that 5hivji would regard Hatch as a celebrator; Pratt as an occasional critic; while he seeks himself to provide consistent explanation. Hatch does not mention 5hivji – nor indeed any recent academic work – but he makes it plain that he does not agree with the assumptions of the left criticism. ‘In Tanganyika’, he writes of the period just after independence, ‘there were no classes’. As for Pratt, he is familiar with the earlier work of Shivji and very much concerned explicitly to refute it. Hatch’s book seems to me to be unconvincing on contemporary Tanzania. It offers an interesting account of the odd combination of intellectual influences operating on Nyerere under colonialism. It balances the stereotyped and appalling image of African leadership associated with General Amin by presenting an attractive and persuasive counter picture of Nyerere as ‘philosopher king’. But the tone of the book is too unconditionally approving. At a time when Tanzania faces severe economic crisis; when her domestic policy is under sustained attack from radical intellectuals both inside and outside the territory; when her policy towards southern Africa is under attack from elements in the liberation movements; it does not serve merely to ignore these difficulties and this criticism. Both have to be met. Hatch was close to Nyerere in the years leading up to independence, as he reminds us in his book. But it is perhaps significant that it is Pratt, with his much less celebratory approach, who has recently been much closer to the Tanzanian situation and to Nyerere’s own thinking about it. Pratt is of course very much his own man and his book is in no sense an ‘authorised’ account. But it does reflect the facts and the moods as they are seen and expressed in Dar es Salaam. It is an attempt to produce a consistent explanation in contrast to the radical consistencies of Shivji. Hence to read these two books is to enter into a debate which is going on in Dar es Salaam and among academic Tanzanianists elsewhere; a debate which is sometimes artificial and abstruse but which is essentially relevant to the present and future of Tanzania. Within the confines of this Bulletin it is not possible to do more than to sketch the outline of Shivji’s critique and Pratt’s reply to it, but it may be useful at anyone to do that. Shivji focusses on some of the most celebrated achievements of Nyerere’s government and interprets them in different and disconcerting ways. Many commentators have regarded Nyerere’s victory over the ‘racialists’ in TANU as opening the way for a socialist option; still more commentators have regarded the Arusha Declaration as heralding a break through to a socialist austerity, equality and self-reliance. Shivji does not see these episodes as landmarks on the road to a true socialism. He sees them instead as landmarks in the victory of what he calls the bureaucratic bourgeoisie, a new class which has successfully employed the slogans first of liberalism and then of socialism to entrench themselves in power and to undermine their rivals. How can such a case be argued? 5hivji begins with an analysis of the various classes and their interests in the last stages of colonialism. These classes had been called into existence by the needs of the colonial economy, which had extracted a surplus from Tanzanian agricultural production for the benefit of the metropolitan bourgeoisie, who were absent from Tanzania but nevertheless securely at the top of its hierarchy of classes. Below them came a series of classes necessary in one way or another to the functioning of the system. Most prosperous was what 5hivji calls the ‘commercial bourgeoisie’, whose role it was to cream off the agricultural surplus through trading operations and who were also allowed to accumulate some capital locally. The existence of this class as a class has been obscured, Shivji argues, by the fact that it was ethnically distinct. The commercial bourgeoisie consisted of Asian entrepreneurs, professional men and business men. Partly for this reason and partly because it profited from the colonial system this local bourgeoisie offered no challenge to colonialism. Other classes called into existence by colonialism were less contented. Shivji distinguishes four broad classes – the petty bourgeoisie, the kulak farmers of the rural areas, the workers and the peasants. The petty bourgeoisie was a varied grouping of educated, trained and entrepreneurial Africans – teachers, clerks, traders, ‘intellectuals’, men serving in the police and army. The kulak class was made up of successful cash crop farmers who employed paid labour. The mass of the population had been defined as workers or peasants by the pressures of colonialism. All these groups were discontented with latterday colonialism; the workers and peasants because of low cash rewards and demands for increased output; the kulaks because of the authoritarian and limiting control ‘ over agricultural production; the petty bourgeoisie because traders resented the privileged position of the Asian commercial bourgeoisie and other elements wanted political and economic power. Ordinarily, says Shivji, a petty bourgeoisie is not destined to play a significant role in history nor to acquire power in the state. But this petty bourgeoisie was compelled to oppose the c610nial state because it could not overthrow the commercial bourgeoisie without also overthrowing the state which supported them. This petty bourgeoisie was also bound to take command of the movement for independence. The kulak class was too small to be able to do so; so also were the working class. So the independence movement arose out of a conjunction of interest between the petty bourgeoisie and the broad mass of the people. The independence movement took on an ideological character appropriate to these origins. It was nationalist rather than radical; the workers were not thought of as a crucial element and there was no proletarian ideological influence; in so far as TANU was thought of as a peasant party this came to mean the employment of the sheer weigh~ of the peasants in a non-violent pressure on the colonial state, before which it succumbed. Shivji remarks that to a limited extent this movement served a progressive role, but from his point of view it was already severely flawed. The petty bourgeoisie had very limited economic ambitions; they wished to overthrow the Asian commercial bourgeoisie but they had no wish to break away from Tanzania’s subordinate role in the world capitalist system; they had neither the means nor the consciousness to play the historical role of national bourgeoisies in Europe. The peasants could not introduce into the party any revolutionary element, since Shivji declares that a peasantry can only be revolutionised through the use of proletarian ideology. Hence politics after independence was bound to be limited to the working out of the interests of the different elements of the petty bourgeoisie. Now, the traders had played a particularly important role in TANU. After independence they and others looked for a rapid Africanisation of commercial opportunity. But, so Shivji asserts, the traders and other African entrepreneurs were not nearly so prosperous or influential as such groups were in Kenya. In Tanzania the real power fell into the hands of the intellectuals and managerial petty bourgeoisie who gained control of the machinery of the state. These men chose another strategy – namely to undercut the commercial bourgeoisie, and to a lesser extent the kulaks, by use of the power of the state. In such a situation they could do so while at the same time appearing to be above class struggle and acting in the national interest and with a liberal ideology. In this way Shivji sees the defeat of the ‘racialists’ as a victory for one element in the petty bourgeoisie over another. To Shivji, then, ‘the Arusha nationalisations constituted the first open attempt on the part of the bureaucratic sector of the petty bourgeoisie to carve out an economic base for itself’. As for the leadership code, which other commentators have interpreted as an attempt to prevent the rise of a privileged bureaucracy, Shivji remarks that ‘the code was the first act of class self-restraint imposed on the individual members of the class in the long-term interests of the class as a whole’. ‘Individual members of the class cannot be allowed to accumulate’, he writes later, ‘because it is the function of the state to accumulate on behalf of the class as a whole’. Shivji makes a similar analysis of the other Arusha policies. ‘The very policy of Ujamaa Vijijini reflects its petty bourgeois class character … (its) objective effect … is to integrate the non-monetarised sector within the cash economy (and) this means integration within the world capitalist system’. ‘The implicit aim of the whole strategy is to raise production for the world market … The policy paper says hardly anything about a programme for simultaneous industrial development … but then the production of agriculture as the dominant economic sector and the peasantry as the numerically dominant class is precisely one of the most marked characteristics of underdevelopment’. Thus Shivji sees ‘Socialism and Rural Development’ as showing ‘a complete lack of understanding of capitalism as a system’. In fact Nyerere’s policy is carrying out the historic mission of integrating Tanzanian cultivators more fully into the world capitalist system than the colonial state was able to do. In domestic terms, the policy is an attempt to continue the alliance which brought about independence. The peasantry, firmly under the control of the bureaucratic-elite, are to provide the mass base. The bureaucratic elite, says Shivji; have a horror and fear of an industrial working class and hence have no plans for industrialisation. Plainly he does not see this collection of policies as socialist in any true sense. However, he sees a series of developments since the Arusha Declaration as clearing the way for a further class struggle which may bring about a truer socialism. The immediate aftermath saw the attempted resistance to the Arusha policies born by the commercial bourgeoisie and by the other elements of the petty bourgeoisie. This resistance has been in effect defeated. Hence there has been a clearing of the ground. ‘The very class struggle between the petty bourgeoisie (led by the bureaucratic bourgeoisie) and the commercial bourgeoisie was not only inevitable but historically necessary a such as political independence was necessary for the conduct of this class struggle. In a way, this struggle is helping to clear the way for further struggles unencumbered by the obfuscation of the racial divisions The most important role played by the bureaucratic bourgeoisie has been in the sphere of ideology. The vigorous “anti-imperialism” and support for the liberation movements have had their effects on the internal dynamics of the country … Thirdly, the historical necessity for expanding the public sector through the Arusha Declaration put socialism on the agenda for the first time in a concrete way. Discussion and debates about socialism are bound to contribute to t he consciousness of the people.’ But ‘whatever progressive role this class may have played politically at a particular juncture, it is being fast exhausted as the contradictions with the exploited classes, the workers and peasants, intensify’. Shivji in fact detects in Tanzania since 1967 ‘the beginnings of proletarian class struggle’. He does not argue, of course, that there is yet a large or clearly defined proletariat. But he emphasises strongly the key role that can be played by proletarian ideas emanating from a radical working class, however small. He argues that there has been plenty of evidence of the” development of such a proletarian consciousness in the worker take-avers of factories, just as there has been plenty of evidence of a bureaucratic backlash. Now here Shivji has some more re-interpreting to do. The workers were acting in terms of the Mwongozo document, which after all was promulgated by TANU and which some have interpreted as evidence of Nyerere’s desire to ensure participation rather than bureaucratic dominance. Shivji sees this pronouncement as forced upon the government because of its fear that the ‘right wing’ opposition from the defeated elements of the petty bourgeoisie and the commercial bourgeoisie might gain foreign support. The government needed to appeal for popular support and thus gave an opening for worker assertion. But ‘Mwongozo acted like a vehicle to carry the contradiction between the workers and the bureaucratic bourgeoisie to the fore. Immediately following … there was a spate of workers’ strikes’. Shivji’s account of these ‘post-Mwongozo proletarian struggles’ is in many ways the most interesting part of the book, but this already long summary must be brought to a close. Shivji concludes: ‘The fundamental contradiction between the exploiter and the exploited … is going to be the dominant one henceforth. True, the workers’ struggles we have described have been sporadic and not necessarily couched in conscious class ideology. The reaction of the workers has been more a consequence of their class instinct, rather than because of definite class consciousness. But class consciousness does not come spontaneously. It is the role of proletarian ideology to develop class instinct into class consciousness. Meanwhile the workers have definitely declared that the stage of history in which they were used as cannon fodder in the intra-petty bourgeois struggles to be fast coming to an end. This time it will be their own struggles – their own class war – and the struggle of their fellow exploited class, the poor peasants, that they will fight, not to replace one exploiter with another but’ to begin to replace the very system of exploitation’. 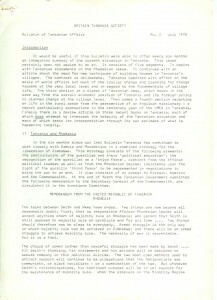 How does Pratt respond to this analysis of Tanzanian socialism? In essence he does so by allowing that a development on the lines suggested by Shivji might perhaps eventually have taken place in Tanzania but that the policies of the Arusha Declaration and of Mwongozo have been successfully launched specifically to halt such a development before it becomes dangerous. Before the Arusha Declaration Pratt gives away a good many of the points made by Nyerere’s critics. Yes, he agrees that Nyerere was at first happy enough to continue with British development policies, or lack of them. Yes, he agrees that there was drift and lack of decision up to 1967. Yes, in some ways Tanzania in those years was a classic neo-colonial state. But for Pratt none of this had the inevitability of the working out of the imperatives of international capitalism or of the class war. The pressures upon Tanzania from outside were not so great that it was impossible for the Tanzanian government to choose its own policy of internal socialism, however unpopular it might be with the capitalist world. The rise of a Tanzanian bureaucracy had not hardened into a class. There was time to change. And for Pratt, the Arusha Declaration was a real change; the announcement of a genuine, progressive and valid Tanzanian route to socialism. Two passages in Pratt’s account merit quotation as a direct riposte to the 5hivji-style analysis, though it must be said that these are in a way incidental to Pratt’s own narrative purpose. I have sought in this review to present readers with an abbreviated introduction to the debate between 5hivji and Pratt, rather than to seek to conclude between them. It is necessary to say that both books have weaknesses. Shivji’s is often longer on assertion than it is on evidence; he sometimes descends to the impressionism of the untrained observer, and there is a great need for some firm statistical evidence. Moreover, one cannot help but find the rapidity of the working out of the various stages of the class war a little unconvincing. Pratt also sometimes allows his hopes to overcome his scepticism. Shivji hopes for a militant and conscious working class and on the basis of that hope really rather than the basis of the evidence predicts it. Pratt hop~ that Nyerere remains committed to a participatory socialism into which people grow by persuasion , and on the basis of that hope he rather unconvincingly dismisses the recent enforcement of villagisation as ‘nationalist coercion’ rather than ‘socialist coercion’. Maybe it is even true that the technique adopted by each author – assertion rather than demonstration of class identities by Shivji, political narrative by Pratt – is by definition incapable of demonstrating the truth of their analysis: But the books are both important and the discussion initiated by Shivji is evidently regarded as sufficiently vital inside Tanzania for his book to be distributed there by the official Tanzanian Publishing House. Members of the Society might perhaps give John Hatch to a friend worried that Africa is descending into barbarism or that Tanzania is a puppet of the Chinese; but they should perhaps buy or borrow and read Pratt and Shivji for themselves.